Oh Good Grief .... It's over a 1000 pages ! Back on January 30 I wrote an article about HR1 and just those short two weeks ago HR 1 was 600 plus pages (I know I read it !) and now even though the "cost" of the package came down,HR 1 has increased in size by almost double. Well the stimulus package is already working if you think about it. The print shop is busy. Read more about Oh Good Grief .... It's over a 1000 pages ! 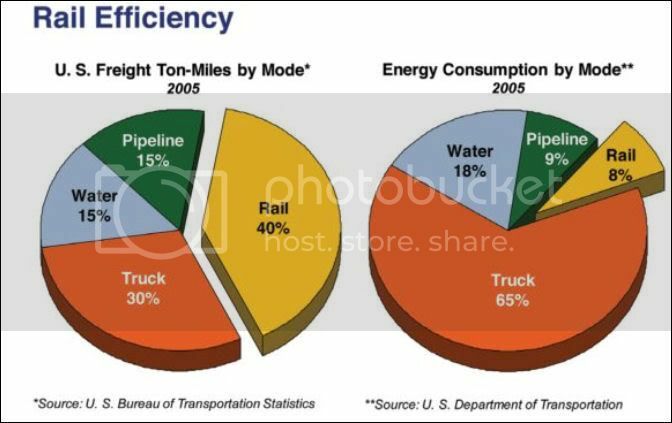 One of the most troublesome aspects of Obama’s stimulus plan is the lack of attention to rail transport. Just look at this graph to see why.